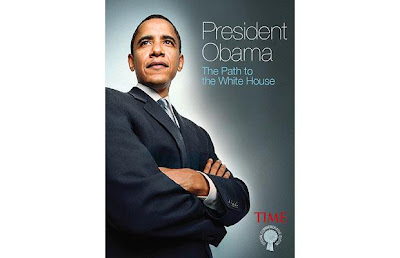 A new book, President Obama : The Path to the White House (David & Charles / TIME £9.99), showcases the photographs of Callie Shell, who began covering Obama for Time Magazine in 2006 when his travelling party numbered just three people in a van: the driver, Obama and Shell. Her photographs reveal Obama's private, unguarded side, his repose with his family, and capture the awe and excitement his campaign generated . 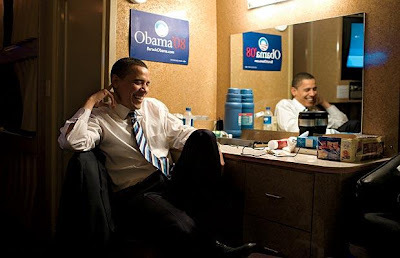 November 7 2007 : Ready for showtime. 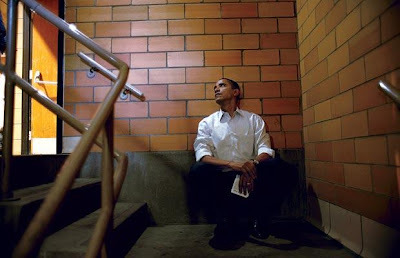 Drumming up support in county after county, Obama, in a rare solitary moment, waits in a stairwell before addressing a crowd in Muscatine, Iowa. January 1 2008 : Strategist. 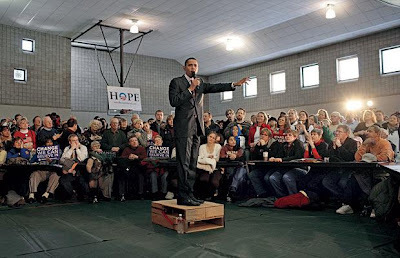 To create his army of volunteers, Obama worked to energise groups like this one, at a gym in Davenport, Iowa. January 6 2008 : Rest for the weary. 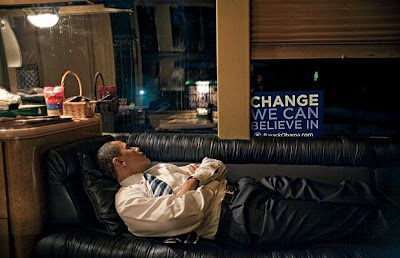 In the middle of a long day of events in New Hampshire, Obama grabs a quick nap on his campaign bus as he heads to another rally. March 1 2008 : Footsore. 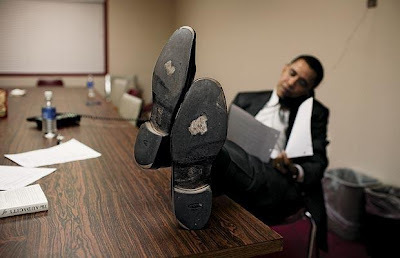 His shoes worn down by campaigning, Obama conducts press interviews on the phone after a rally at Rhode Island College in Providence. April 5 2008 : Competitive streak. 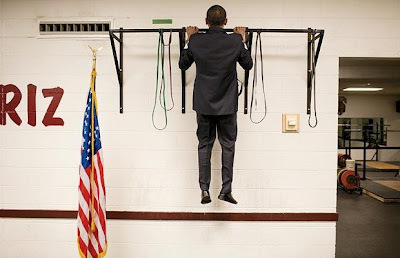 Not to be outsone by two aides who each did a pair of pull-ups, Obama does three before stepping out to address the crowd at the University of Montana. April 21 2008 : Explaining his health plan. 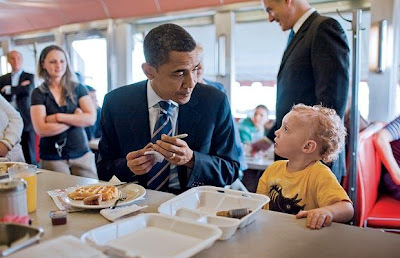 Obama pops in to greet locals, including this curious young man, at a diner in Scranton, a day before the Pennsylvania primary. April 22 2008 : Fuelling up. 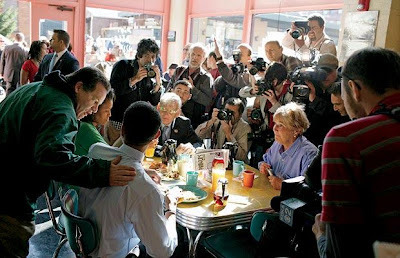 With Michelle (and a large press corps) on hand, Obama grabs a bite at a Pittsburgh diner on the morning of the Pennsylvania primary. 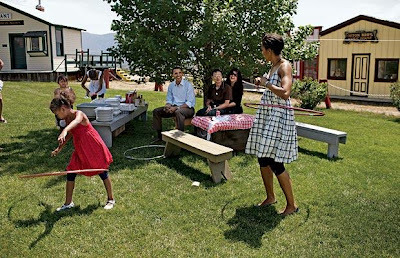 July 4 2008 : Hooping it up. Even at the height of the campaign, there were moments of levity, as at this Independence Day picnic in Butte, Montana. 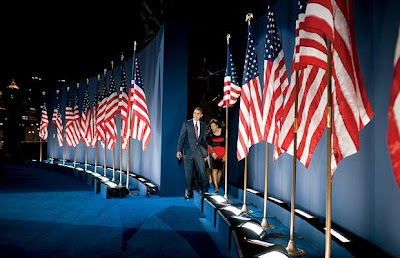 November 4 2008 : Grand entrance. The newly-elected First Couple walk onto the stage at Grant's Field, Chicago.